Erivum Puliyum: Panjipullu Puttu | Ragi (Finger Millet) Puttu | How to make Soft Ragi Puttu Podi from scratch ? Panjipullu Puttu | Ragi (Finger Millet) Puttu | How to make Soft Ragi Puttu Podi from scratch ? Ragi (panjipullu) as we all know, is a calcium rich non diary food product.Also it is a healthy source of iron which is perfect for growing age groups. Ragi is also a low glycemic food and is perfect for diabetics. Ragi keeps the body system warm and so rainy and winter days are perfect for consuming ragi. I have had bad experiences from the store brought popular brands of ragi flour in the past(once I got a plastic thread cut in several pieces in a pack). Its always better to sieve the store brought flour if you are using. Once I moved back to India,I started making my own batch of ragi puttu podi each time.I hardly store the podi for long as in that case you need to dry roast the flour very well and for making puttu the well roasted flour tends to make hard puttu whether that be using rice(ari) or any other whole grain. 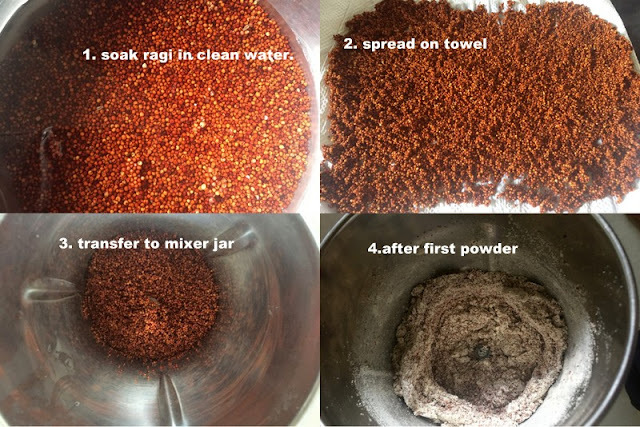 Puttu podi is always a mildly roasted podi.These days we get cleaned and washed panjipullu(ragi) seeds packet in super markets,so there is no hard work to clean the seeds from impurities.The only work left is soaking up the ragi and powdering. Ragi is one such whole grain where all the three parts of the seed (bran,germ and endosperm) are powdered and used.The bran gets powdered at the end and if you are looking for a milder colour ragi flour,discard the bran(outer cover) whenever you feel the colour is deep brown during processing(powdering). Ragi becomes rubbery and tends to stick in the mouth if you make puttu with ragi flour alone like oats puttu. And so ragi was a big 'no' when it comes to making puttu. I have tried all ways of making this ragi puttu flour and below mentioned is the right ratio of getting a soft delicious ragi puttu. I find making puttu is a rather easier way to sneak in ragi for kids.So I usually end up mixing one portion of homemade rice flour(puttu podi) which makes the texture right and tastes really good. Do check out mulayari puttu , barley puttu made from scratch too. 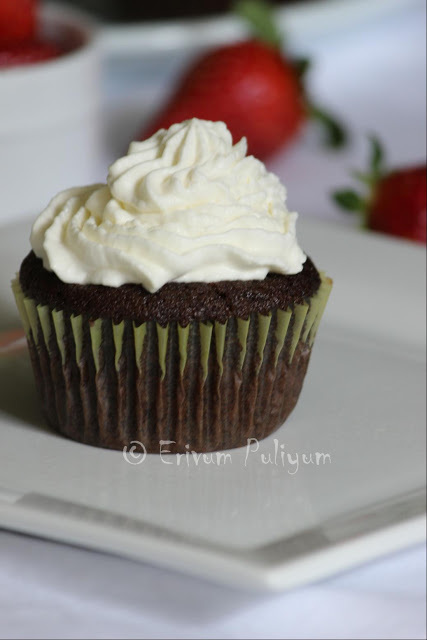 I have also posted a few other puttu recipes like ethakka puttu, ari puttu and tricolor puttu, check these out if interested. 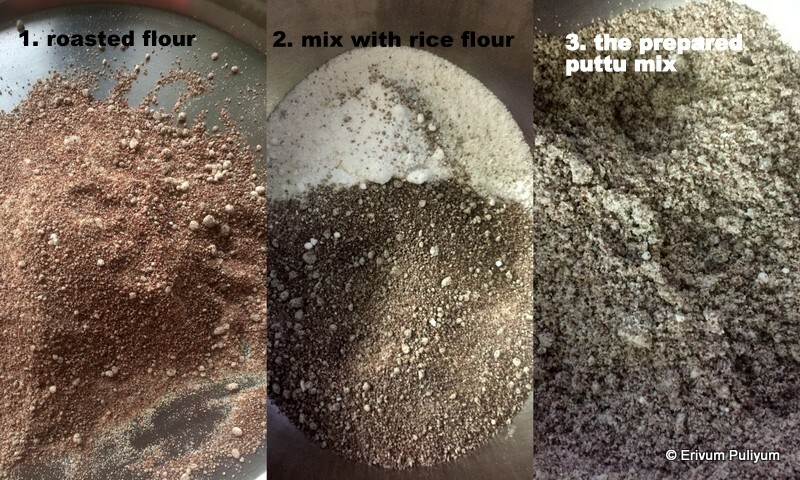 Please go through the notes section for tips and tricks while making ragi puttu podi. Wash and soak panjipullu(ragi) for 4-5 hours in clear fresh water. Remove any impurities if you are buying loose pack. 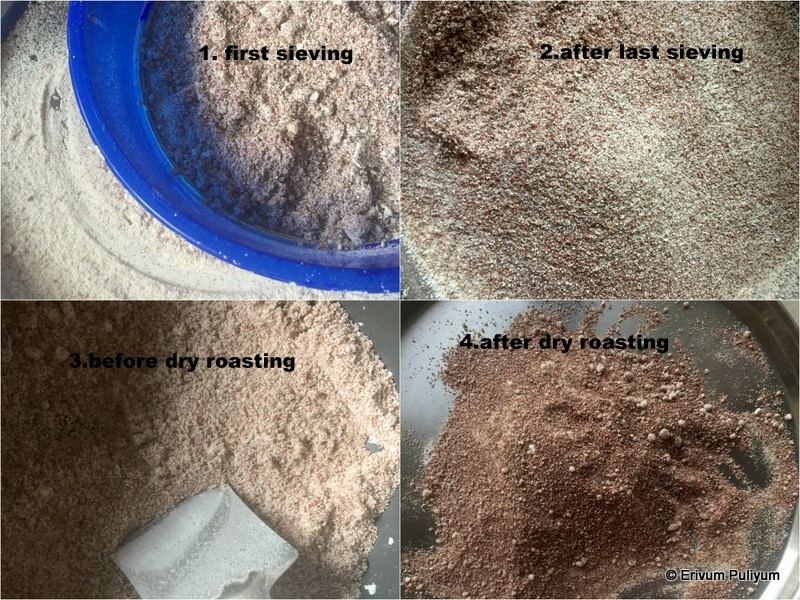 Drain all water in a sieve and spread the ragi on a clean towel or layers of paper towel. The excess water is absorbed.Leave for 10 minutes. Transfer half of the ragi to a mixer and grind to a smooth powder. Transfer the mix in a sieve(for getting puttu podi,the podi shouldn't be very smooth so use a sieve with slightly larger holes than the smooth ) and get the powder ready. Transfer the remaining half powdered along with remaining ragi seeds left over to powder. Run the mixer until its powdered. 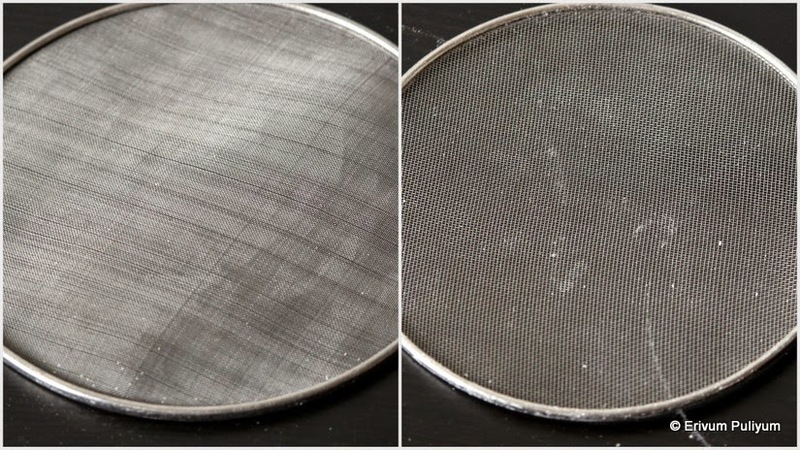 Sieve in the similar way until you finish powdering the whole(read notes below). Once you have the whole mix powdered, dry roast in a thick bottomed pan for 3-4 minutes on medium flame or until you see steam seeping through the flour upwards. Remember to stir using a long handle spoon so that the flour close to the flame is not burnt. Switch off flame and transfer the flour immediately to layers of paper towel and leave to cool completely. If you wish to store the puttu podi longer then deep roasting the flour (till there is no moisture present) is required. In that case the flour is more drier and needs more water to make puttu mixture. Ragi Puttu podi is ready to use(read notes). Measure ragi flour 1 cup and rice flour 1/2 cup in a bowl.Add pinch of salt to taste.Start drizzling water in the flour as to get a crumbled flour texture. Keep adding water as required till you get the correct consistency. The right consistency is when you try making a small bowl of the flour by pressing in hand,it should form a ball. Leave covered for another 10 mins. In the mean time,grate the coconut and keep ready. Fill the cooker with enough water,cover with lid without weight. Place on flame to boil. Fill the puttu maker with coconut and then prepared podi. Alternate with layers of grated coconut and flour till you reach the top.Cover the lid and place this on the cooker and let it steam. Wait for 5 mins once the steam seeps out from the top.Remove on a plate by pushing through the base.Repeat the same step with remaining prepared puttu podi. 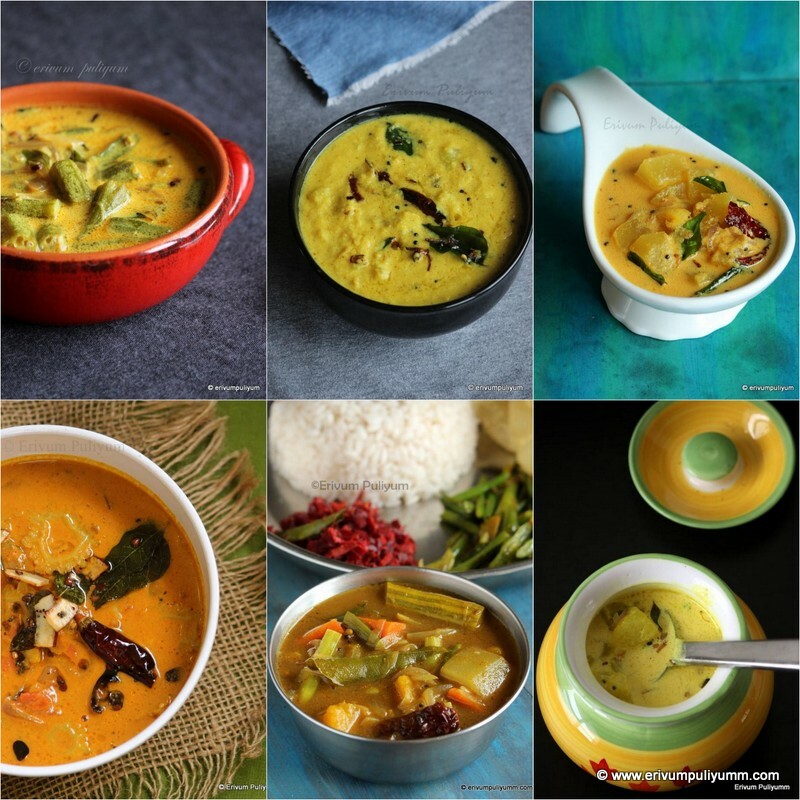 Enjoy with bananas or kadala curry. * One cup of ragi seeds powdered yields 3/4 cup of ragi flour. * For making ragi puttu podi, I have tried another tip which makes the ragi flour even better i.e. when you sieve the ragi the first time after powdering, I usually sieve it in a sieve where you get smooth powder. Then change the sieve to the one with bigger holes for puttu podi thereafter. That means the first time sieving use the smooth powder sieve and thereafter switch to the regular puttu podi sieve. * If you don't wish to have the bran part of the seed, then discard the remaining left over half powdered ragi after first two sieves. The bran tends to get powdered towards the end. In that case the ragi flour will be lighter in colour and more softer flour. * The flour usually is light in colour once powdered but once you start roasting, the colour tends to become deep brown like cocoa powder. 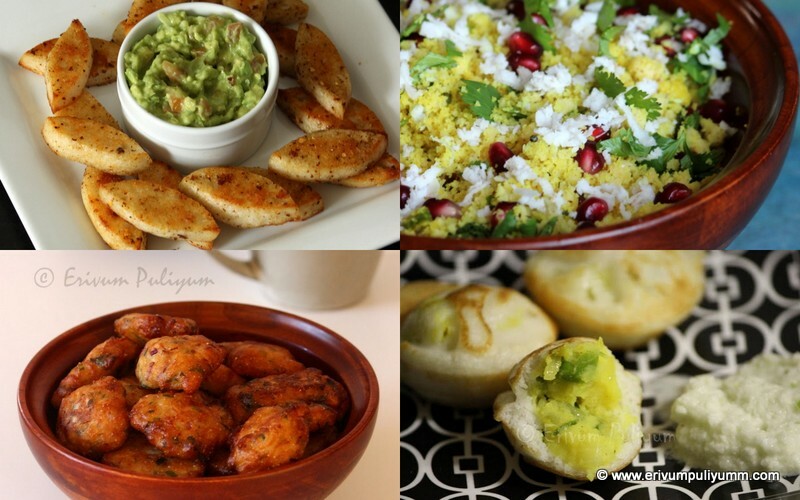 * Also,it is best to prepare the puttu podi the previous day before making puttu so that mild steaming is good and this also helps to get a softer puttu. If you wish to store the puttu podi longer then deep roasting the flour (till there is no moisture present) is required. In that case the flour is more drier and needs more water to make puttu mixture. * The cheratta puttu is made with the proportion mentioned in the recipe and so you find a lighter colour of puttu compared to the other puttu. In the other puttu I used one cup of ragi flour to 1/4 cup of rice flour and so the colour is deeper. I found 1 cup of ragi flour to 1/2 cup of rice flour makes softer delicious puttu.